BS-H, BS-L Chlorine Removal Adsorbent have characteristics of high contents of effective component, high chlorine capacity, high purification ability, good stability and strong strength, the adsorbent process is operated continuously in fixed bed, Both adsorbents are single-use. HCL content can be reduced below 0.5ppm in the purified materials after dechlorinating. BS-L Chlorine Removal Adsorbent is applied to efficient dechlorinating under normal temperature. It has dual function of dechlorinating and desulfuration. It is not only suitable for gas dechlorinating, but also for liquid. BS-L can also be used for hydrogen, synthesis gas, liquefied gas, liquid hydrocarbon’s dechlorinating and desulfuration. 3. These two Chlorine removal adsorbents can solve corrosion problems, and improve production capacity. It has been proved by the usage of the Naphtha reforming pre-hydrogenation unit from Yangzi Petrochemical Aromatics Plant which has 550,000 tons capacity, that BS series adsorbents is significantly better than the ammonia injection, injection of corrosion inhibitors etc. BS-L Chlorine Removal Adsorbent can replace alkaline liquid cleaning operation, and be used for the dechlorination of reforming high H2 and LPG. 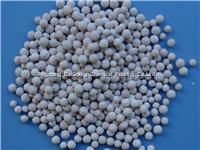 BS-L Chlorine Removal Adsorbent has the characteristics of simplifying processing, simple operation, no pollution etc.